A quarter of a century ago in the Italian Alps, ICEtrekker's founders, producers of high end tire chains, came across a clever product used by walkers to navigate steep icy hills during the winter. It occurred to them that this concept could be improved upon, so they put their collective expertise together and began developing a line of personal traction devices based on the same principles used for vehicle traction: chains, studs and cables. What became clear in this process was the need to address different types of users, conditions and affordability. 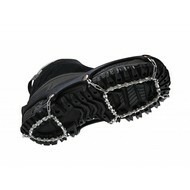 Taking these things into consideration, ICEtrekker developed the ICEtrekkers Chains, Spikes and Diamond Grip lines. The Goal - to provide the best possible products, at the best possible prices for the urban walker, firefighter, policeman or backcountry hiker.